The music industry's biggest stars got gorgeous on the red carpet for the annual awards show. 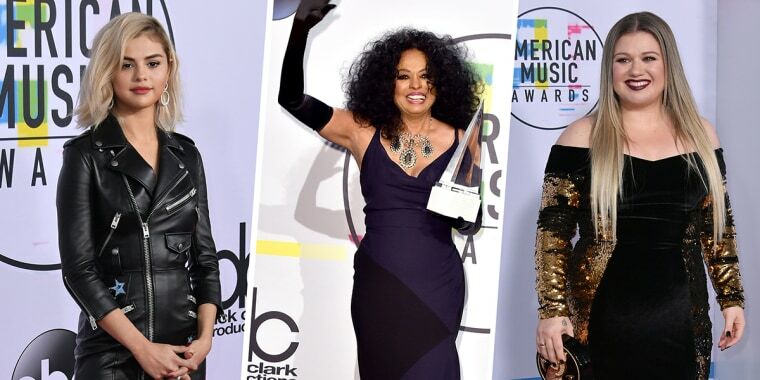 Music's megastars gathered last night to celebrate the 2017 American Music Awards, rocking the stage and the red carpet in a series of stunning looks. Pink walked the red carpet with her husband, Carey Hart. She rocked a strapless hot pink ball gown embroidered with royal blue and gold flowers. Clarkson wore an off-the-shoulder mermaid gown with black velvet down the middle and sparkly gold detailing on the sides. The singer complemented the look with a vampy, dark red lip and black and gold clutch. Tracee Ellis Ross hosted the AMAs in the most stylish fashion! While the actress had a lot of gorgeous outfit changes throughout the evening, on the red carpet she donned a form-fitting gown covered in beautiful deep red sequins. The singer, who recently opened up about undergoing a kidney transplant, returned to the stage last night for a killer performance. While Gomez changed into another gorgeous look on stage, she rocked a fierce leather jacket-inspired mini-dress on the red carpet. Platten wore a jumpsuit that perfectly highlighted her figure. It featured a plunging neckline, sheer panels on the bodice and legs, and shimmery silver stripes. Jenna Dewan Tatum glittered in a gorgeous halter gown covered with champagne sequins. The legend received the AMAs Lifetime Achievement Award, and rocked the red carpet in black velvet gloves and a beautiful purple and black gown. During her performance, she added a dramatic matching tulle shawl to complete the look. Davis looked regal in a white glittery gown with a bold v-neck. She paired the look with dainty bracelets and perfect soft curls. Kidman wore a black cocktail dress with very on-trend over-the-knee boots. This pop country singer may have had the best look of all: a precious baby bump! Decker wore a tea-length off-the-shoulder gown in a perfect rose hue. She paired the look with champagne heels and wavy locks.